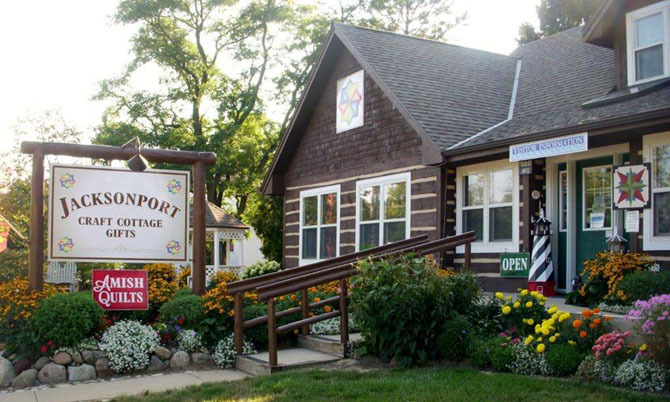 Jacksonport Cottage - Gallery & Gifts features Door Countys premier collection of Fine Art, Gallery, Gifts & Amish Quilts. Open Daily 9-5, May-Oct & Winter weekends. 2017 Amish Quilt & Craft Shows: July 6-9 & October 12-15, Mr. Gs Hall, 5890 Hwy 57 near Jacksonport. Travel Green Certified. Nov-Apr, F-Su 9-5, closed in Jan.
Visit our website, www.JacksonportCottage.com for much more information about our quaint shop in Jacksonport, Wi. Be sure to attend our Amish Quilt & Craft Show to be held July 6-9 and Oct. 12-15, 2017 at Mr. G’s Hall. The Hall is located just south of Jacksonport on Hwy. 57. More information about both of our Amish Quilt & Craft Shows is available on our website. 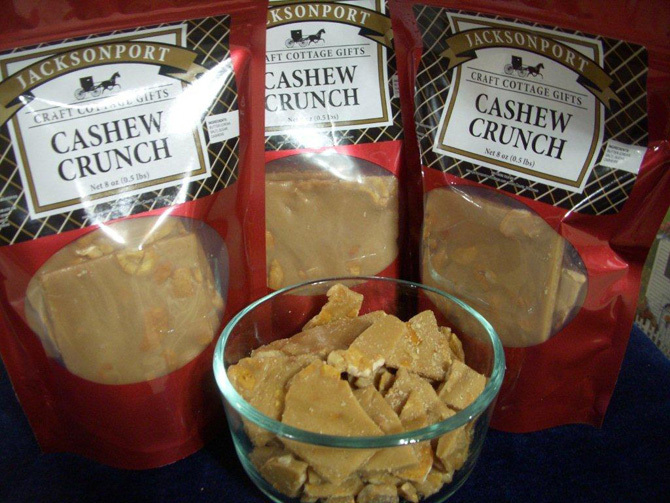 Jacksonport Cottage - Gallery & Gifts is located at 6275 Hwy. 57, in the village of Jacksonport on the Lake Michigan side of Door County, Wisconsin. Opened in 1984, the cozy cottage features the original work of over 120 artists. 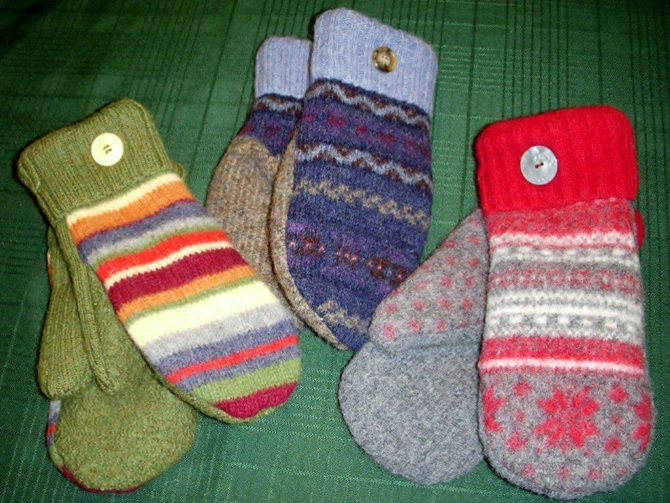 We invite you to visit their "handcrafted gift headquarters" in Door County. The shop occupies the main floor of an 1860’s era log home that has been completely restored to the original log walls on the inside - and in the Spring of 2003 the exterior of the building was completely re-done as well. Highlights include: Amish quilts & Home Decor; baby quilts; cloth dolls; children’s wooden toys; Apparel; doll clothes; hand carved and paper mache’ figures; Door County water colors; Halloween and Christmas corners; and our exclusive Door County Lighthouse Collector Pin series; hand-crafted jewelry and much more. 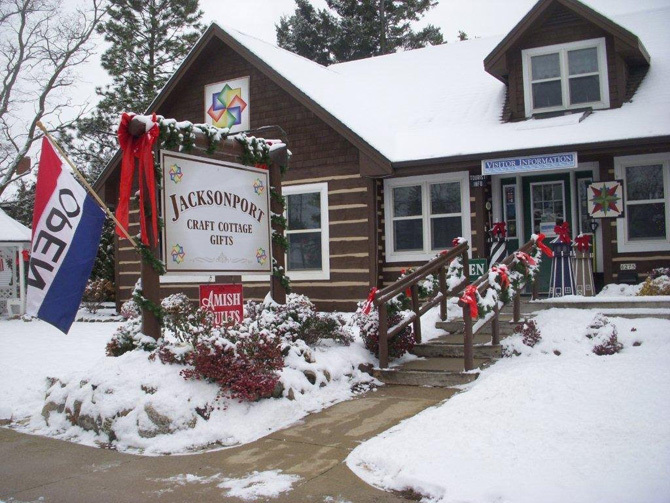 Jacksonport Cottage - Gallery & Gifts is open daily from 9 a.m. to 5 p.m. May 1 to Nov. 1 and is open on winter weekends (Fridays, Saturdays, and Sundays) 9 a.m. to 5 p.m. or by appointment if you phone ahead, (920) 823-2288. Closed in Jan.